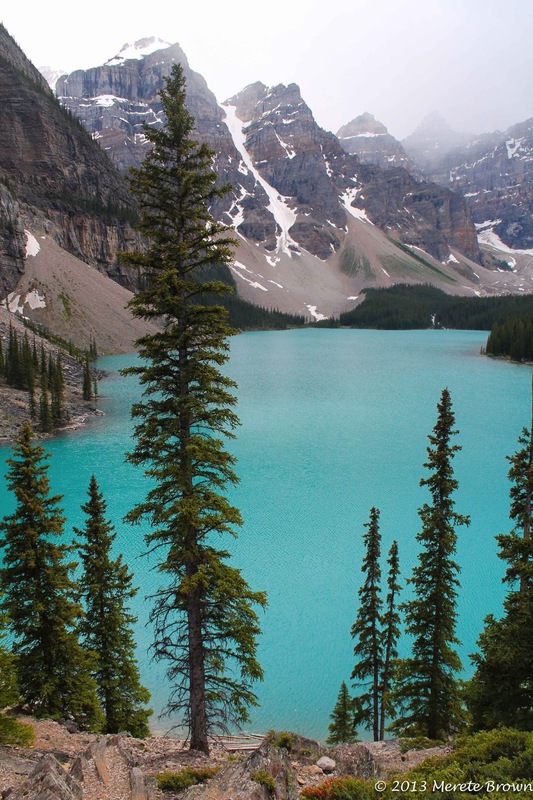 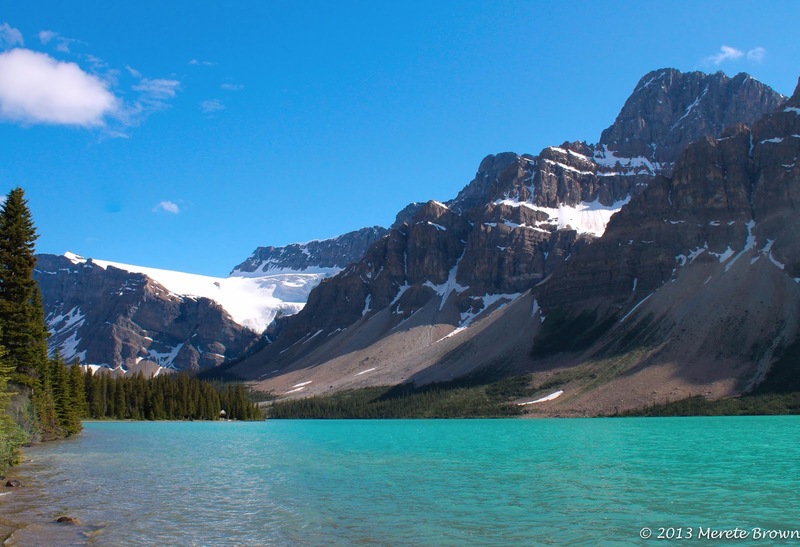 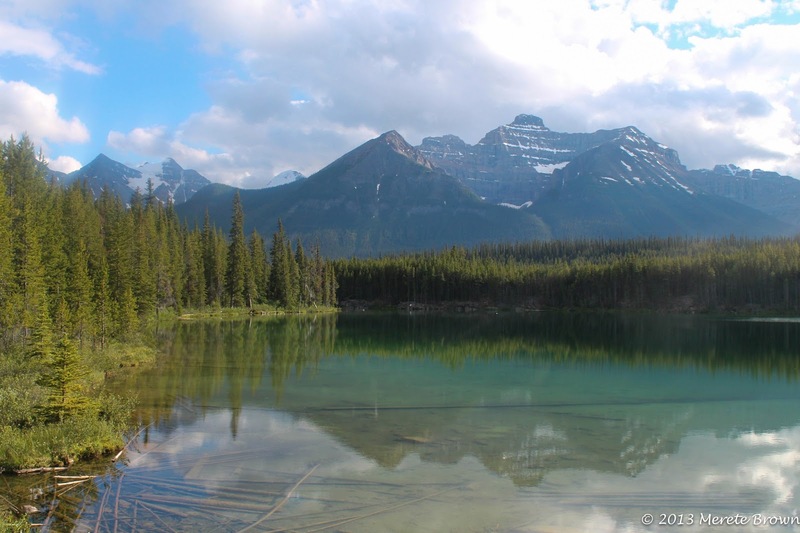 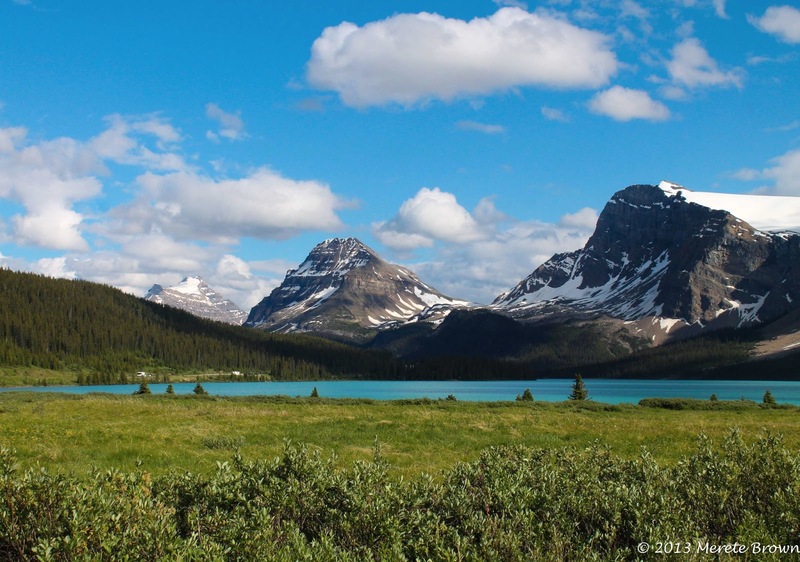 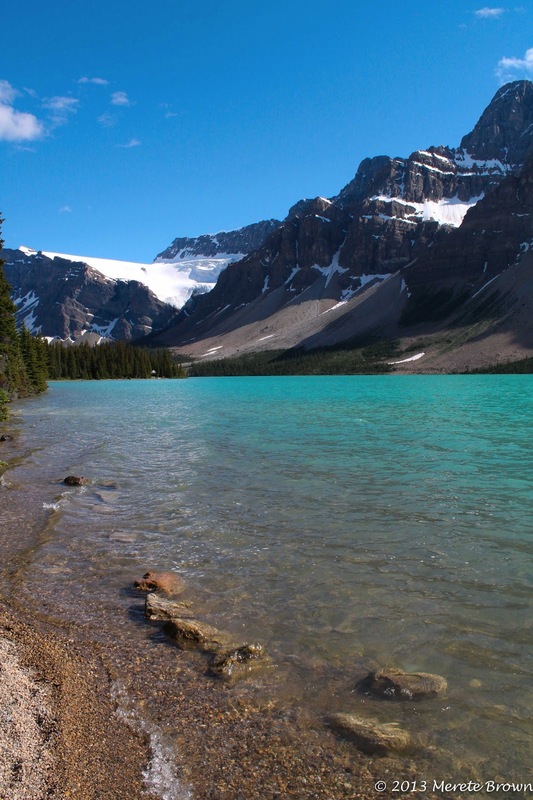 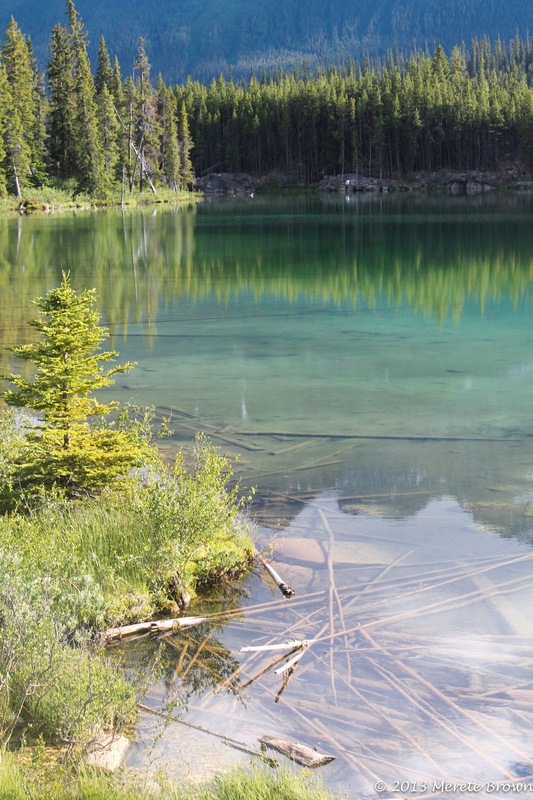 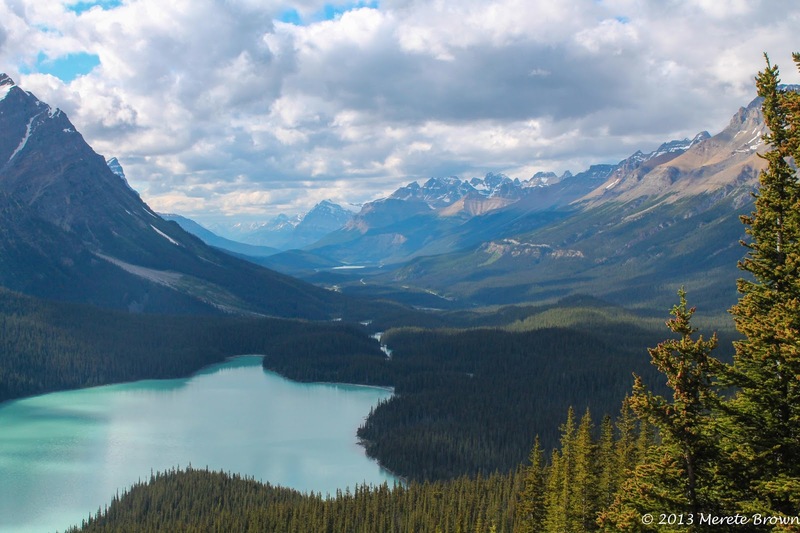 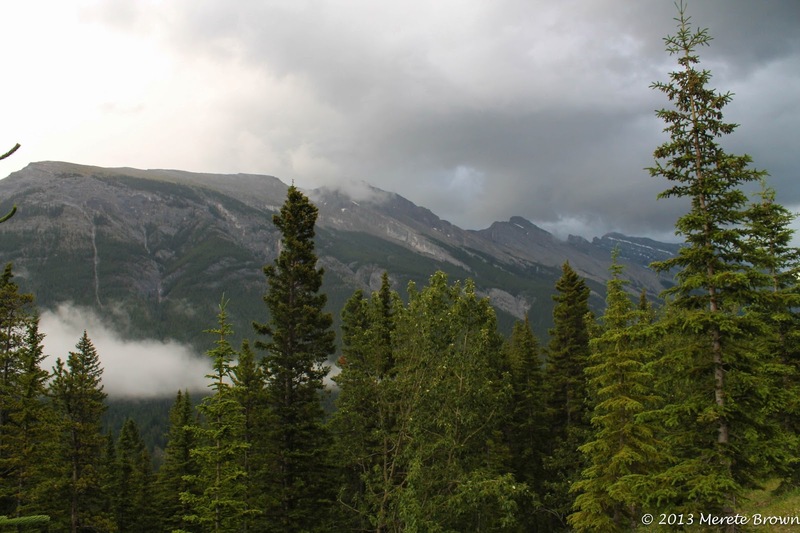 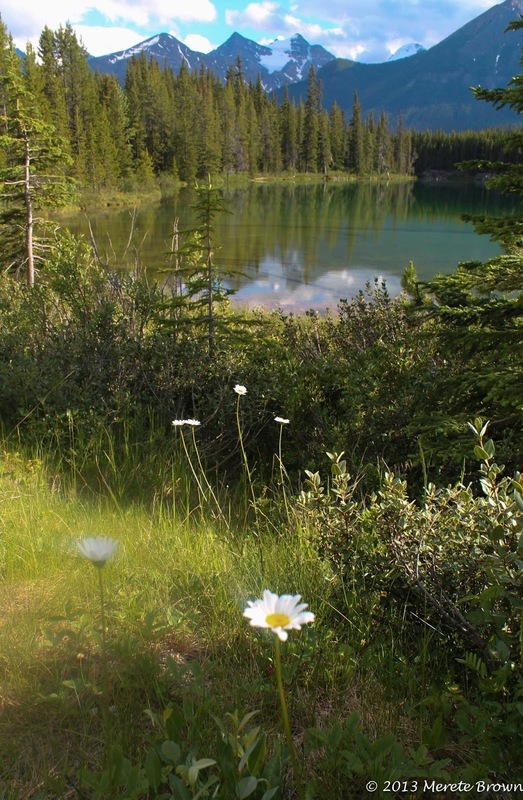 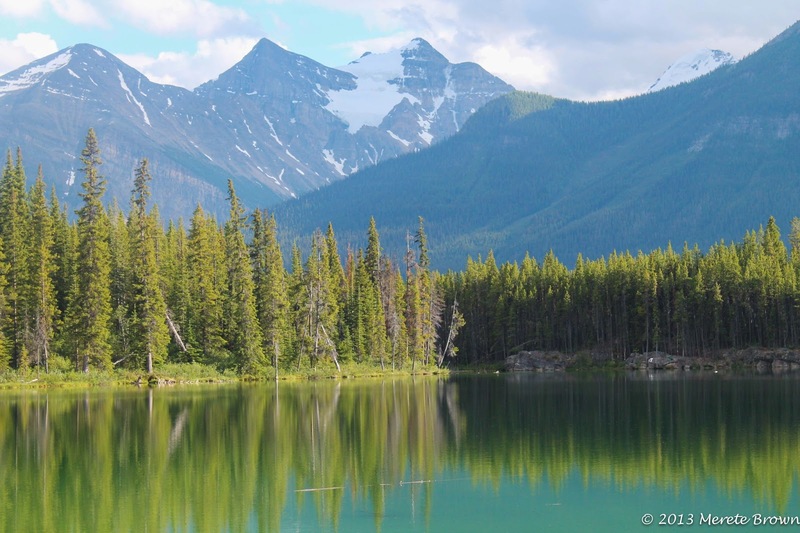 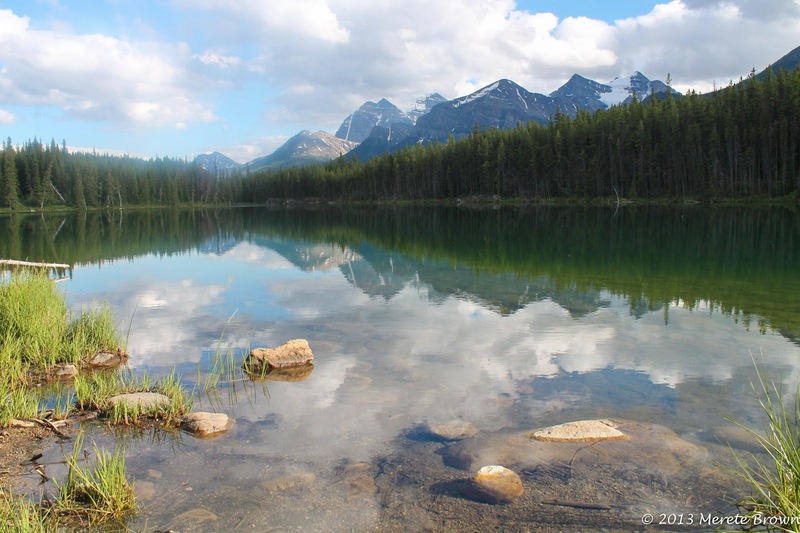 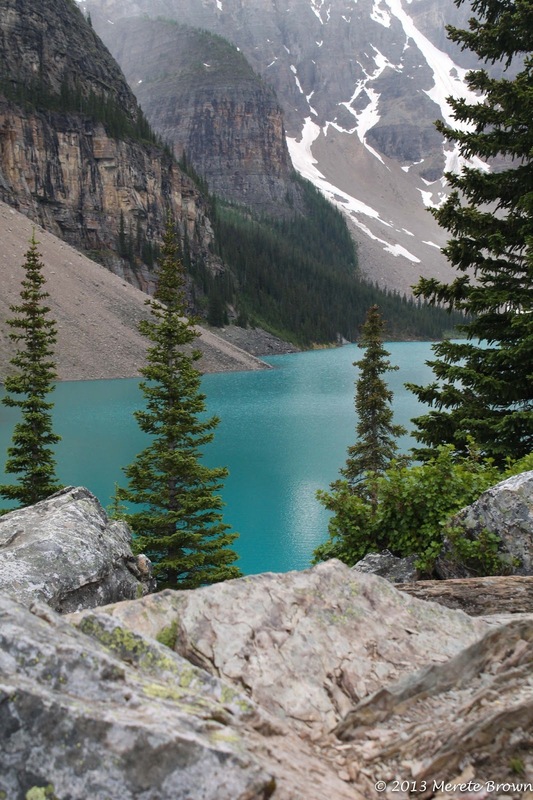 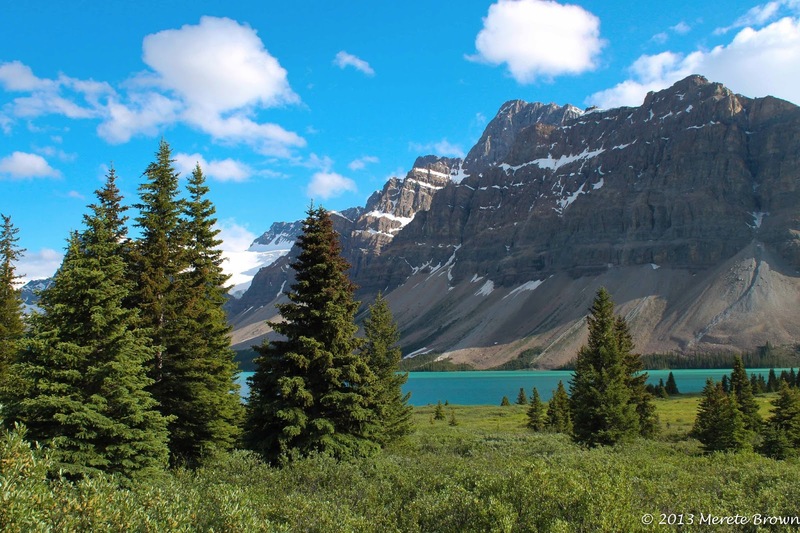 Banff National Park represents the creme de la creme of the Rocky Mountains. 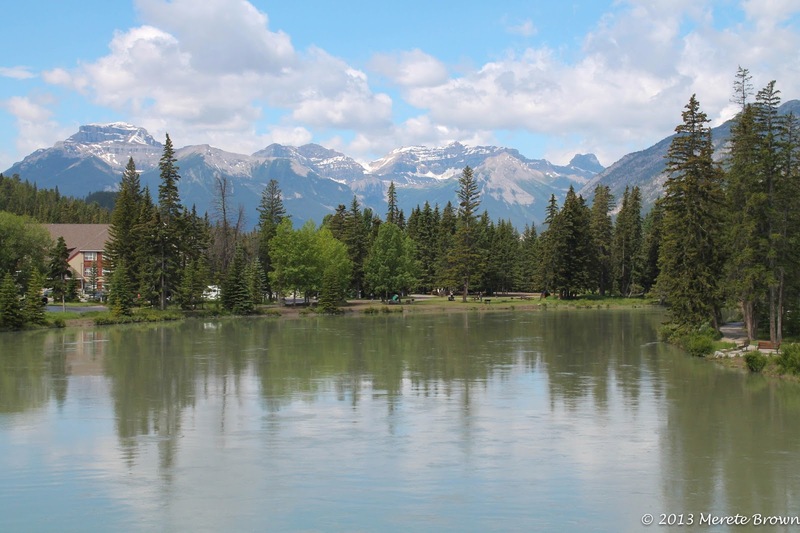 The first national park in Canada and the third in the world, Banff was established in 1885 as a park reserve around the Cave and Basin mineral hot springs (now a historic national site), two years after the completion of Canada’s first transcontinental railroad. 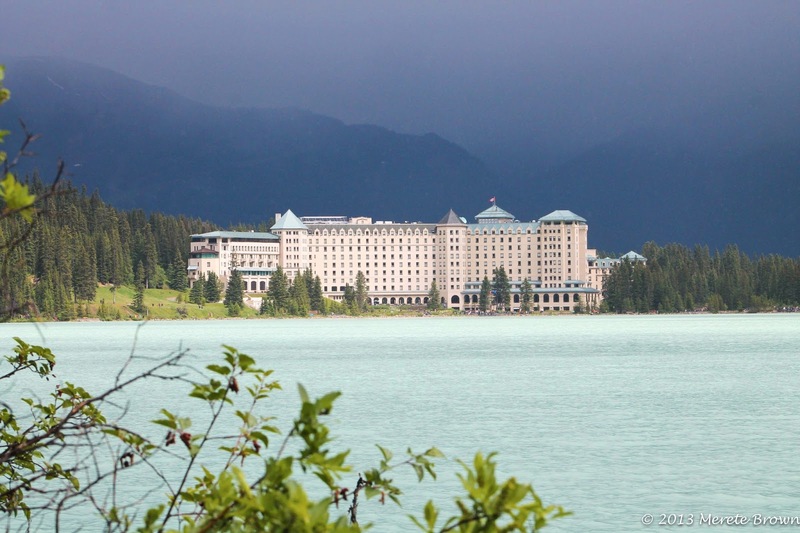 The Canadian Pacific Railway immediately recognized the potential for tourism in the area and began constructing a series of elegant hotels along its main line, attracting people from all over the world. 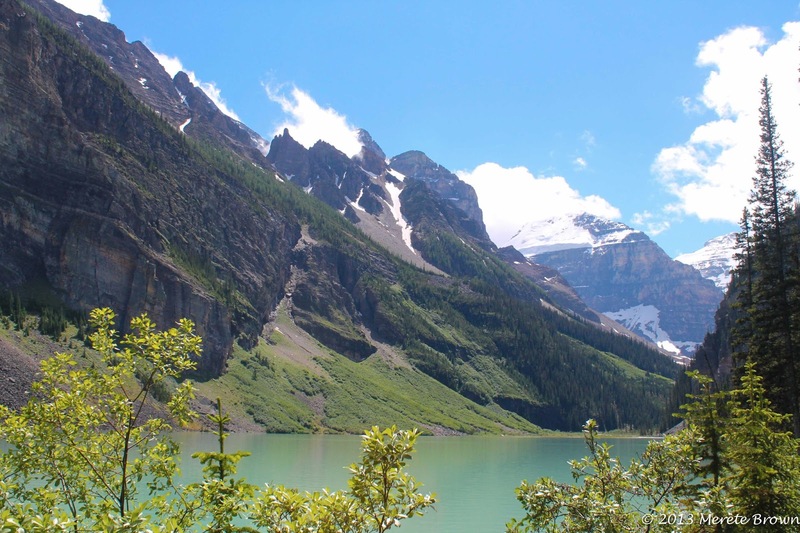 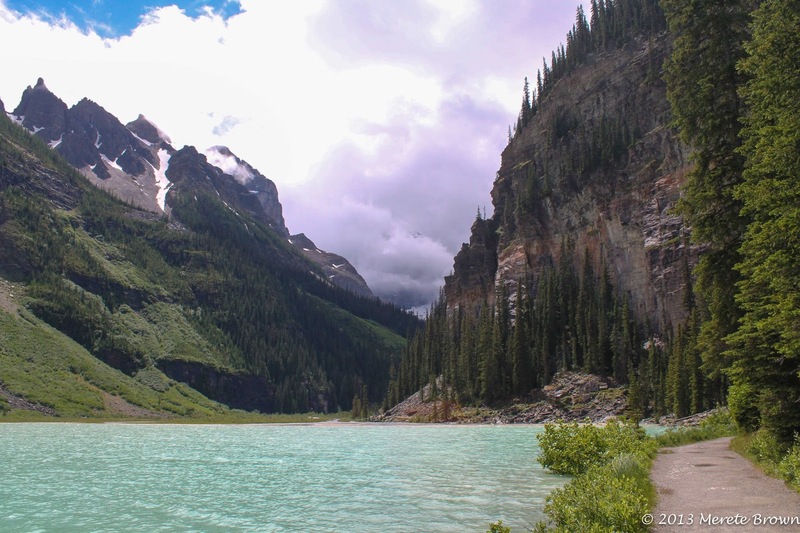 In 1984, Banff National Park, in addition to its neighboring sister parks (Jasper, Kootenay and Yoho National Parks and Mount Robson, Mount Assiniboine and Hamber provincial parks) were designated as a world heritage site collectively as the Canadian Rocky Mountain Parks. 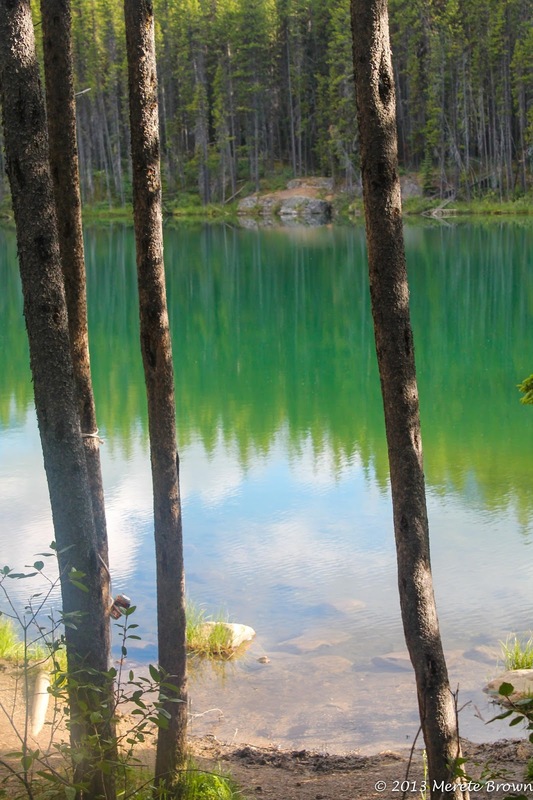 If you ever get the opportunity to visit the area, it will become readily apparent why it was valued so quickly. 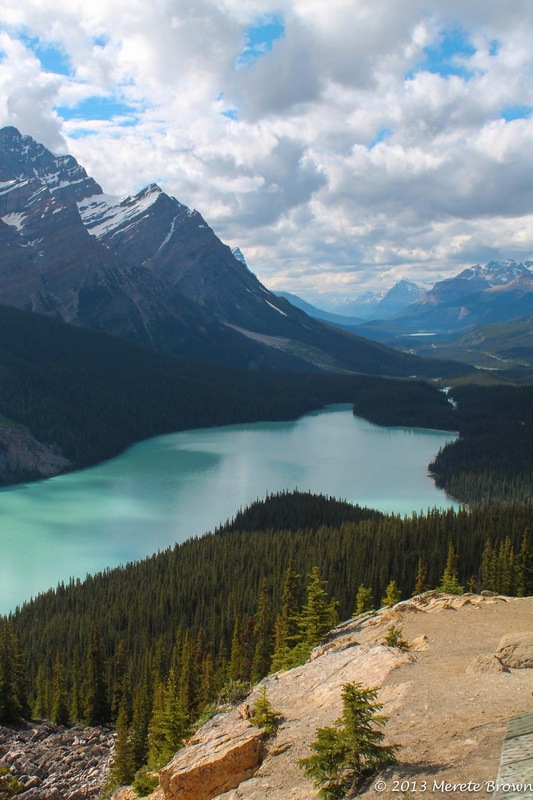 Banff National Park is like a giant canvas splattered with multiple shades of blues, greens, warm and cool neutral tones – white, sandy, cream and granite gray shades – towering up and all around you in the form of mountains, lakes, rivers and glaciers. 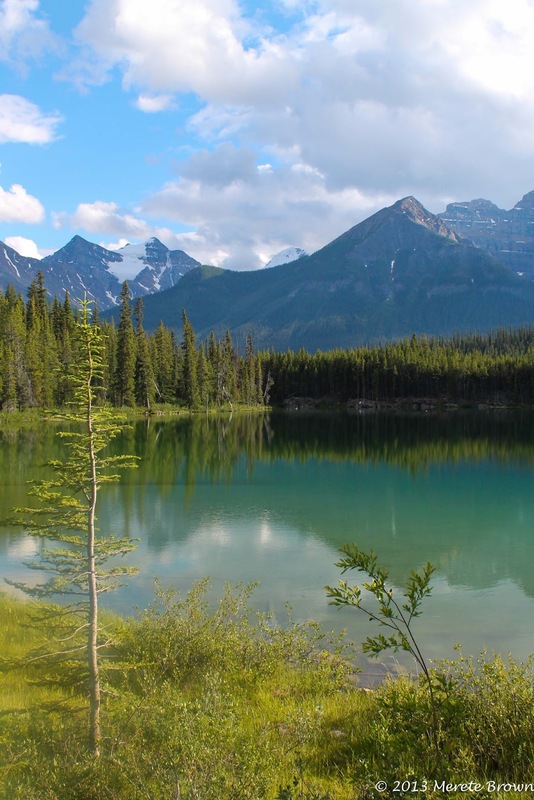 How many shades of green can you spot in these pictures? 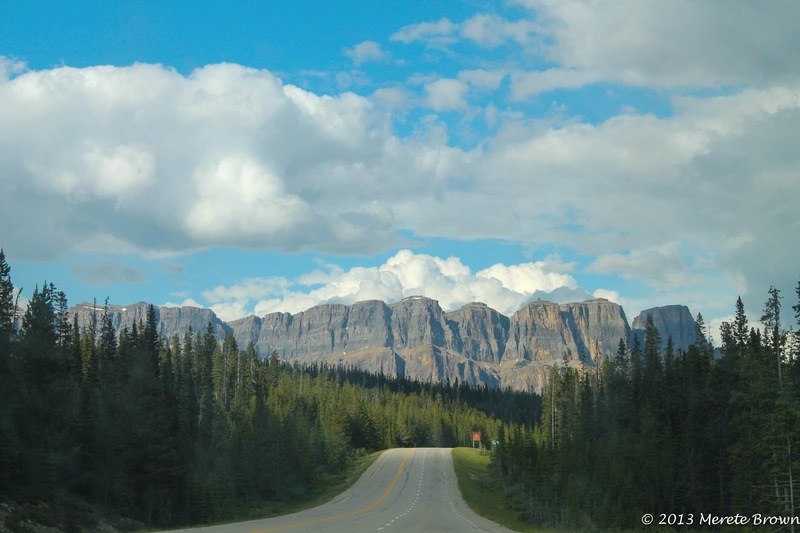 As you drive along one of the highways leading into the park, the landscape appears artificial as if you’ve stepped into a famous painting by Monet. 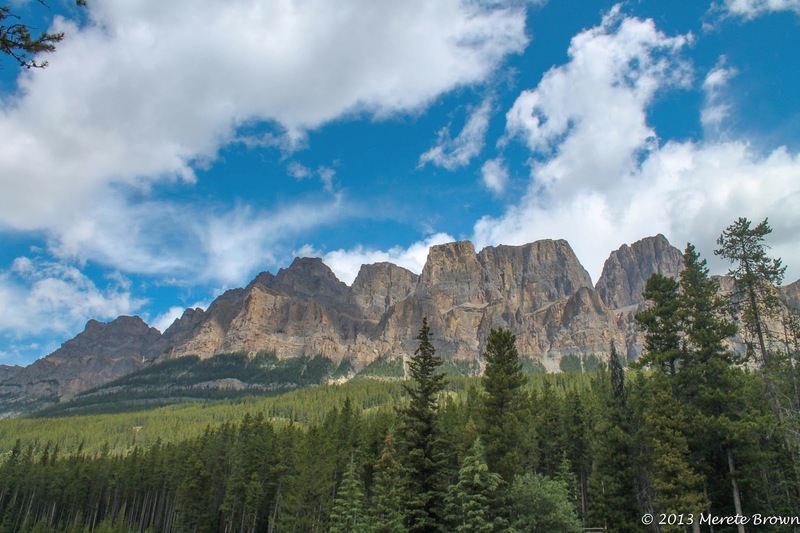 Mountain peaks tower softly against a bright blue background, while clouds float lazily between the peaks. 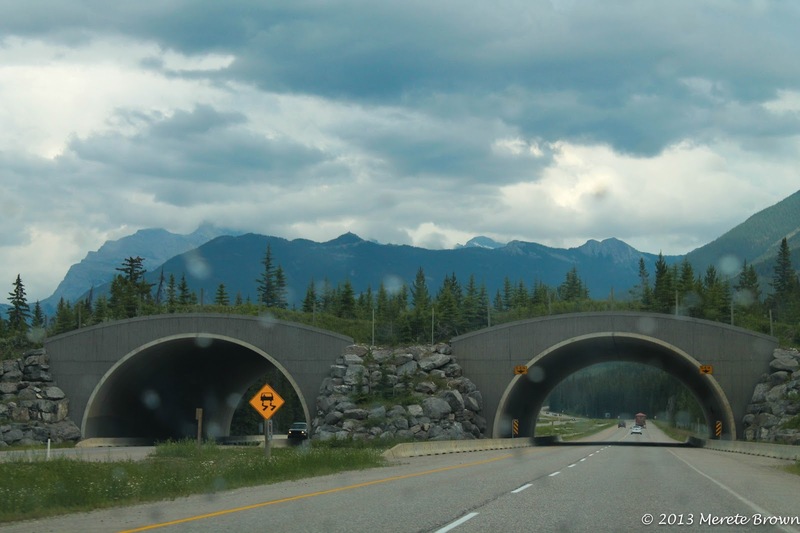 Wildlife bridges traverse the highway to allow animals to cross safely. 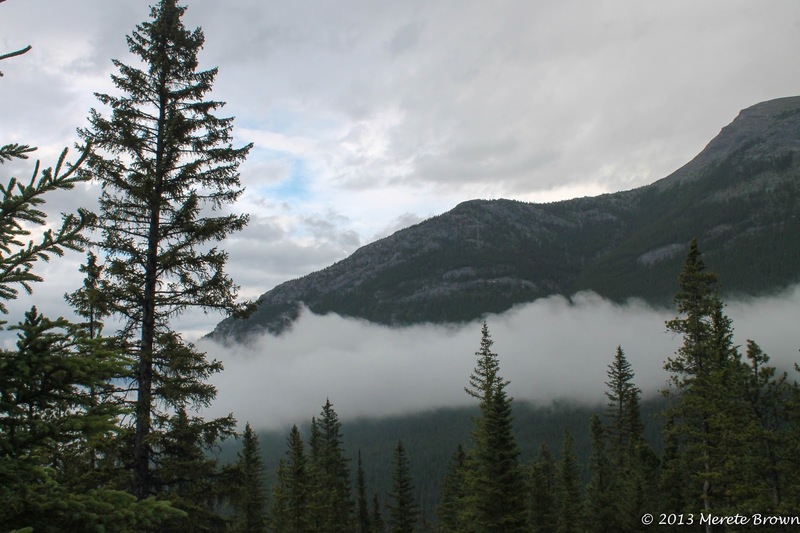 If a storm happens to roll through, the hazy clouds filled with rain linger, sandwiched between the densely packed glacier-covered mountains, until the rain finally falls and a mist rises from the valley. 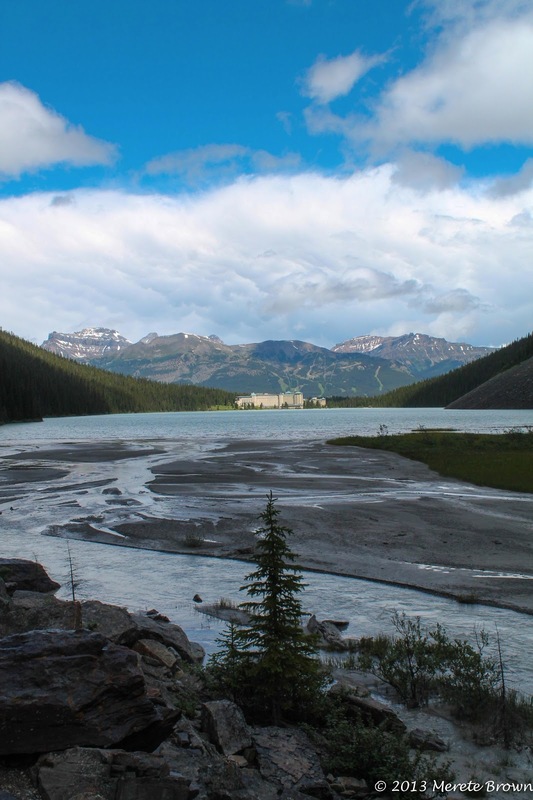 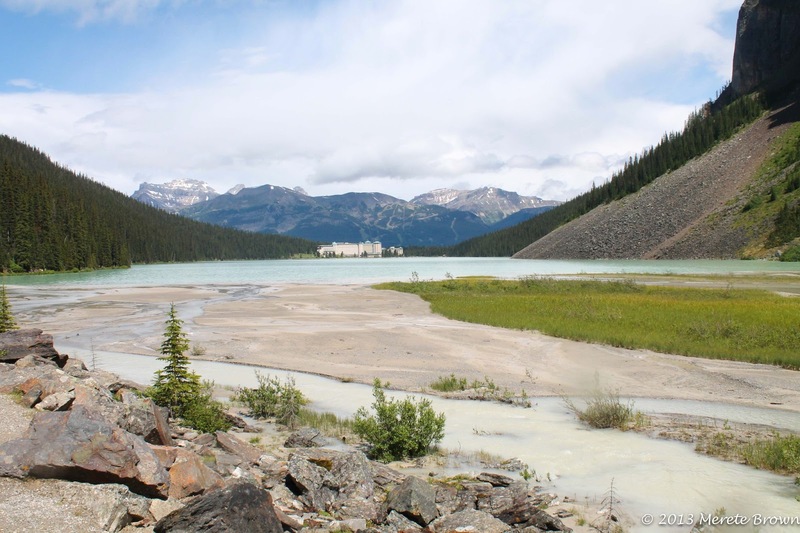 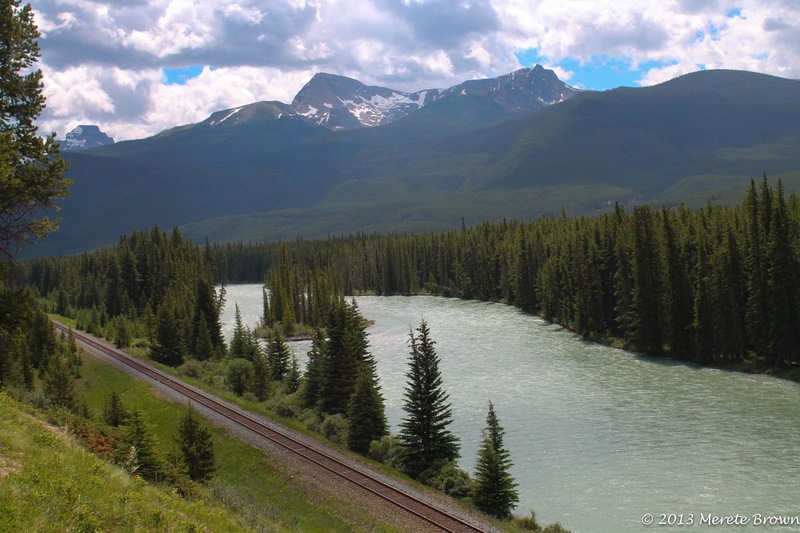 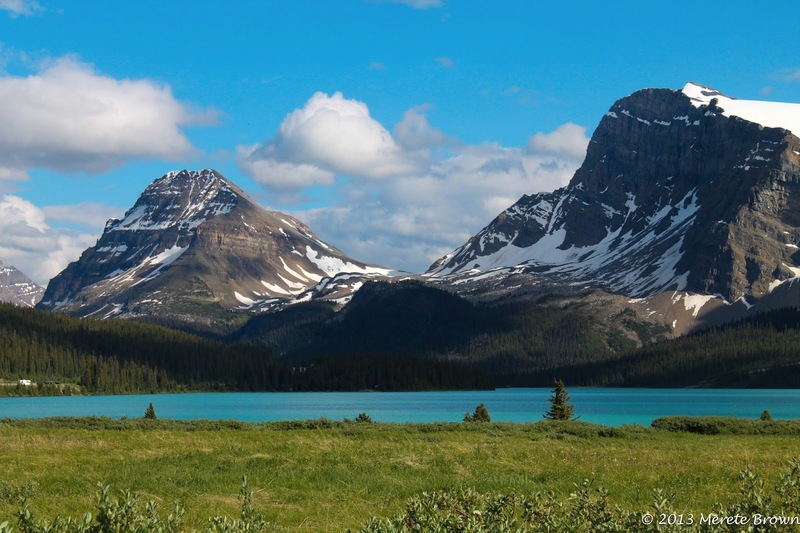 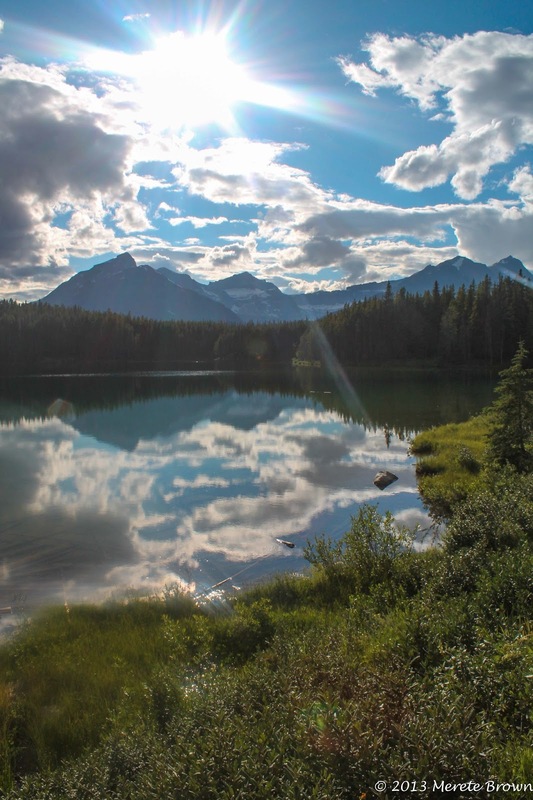 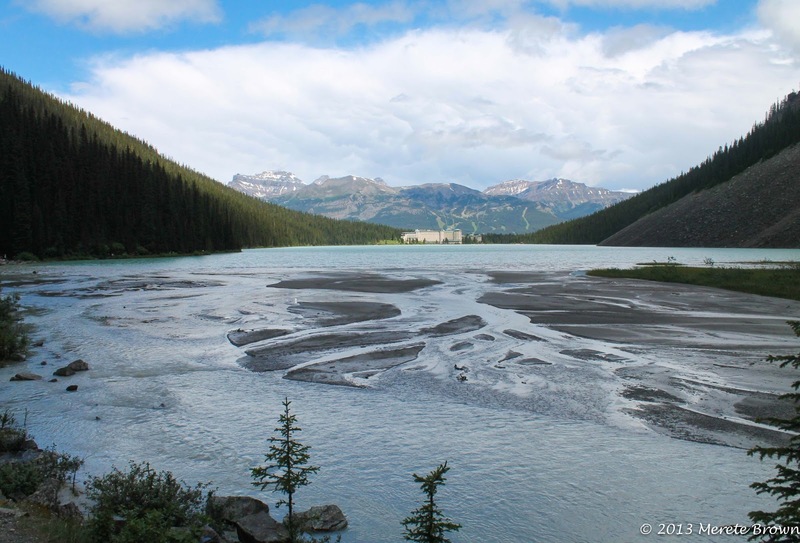 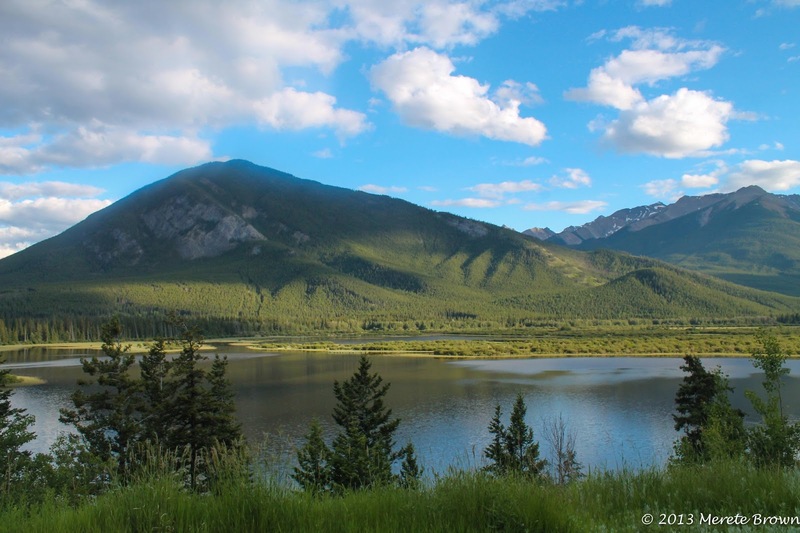 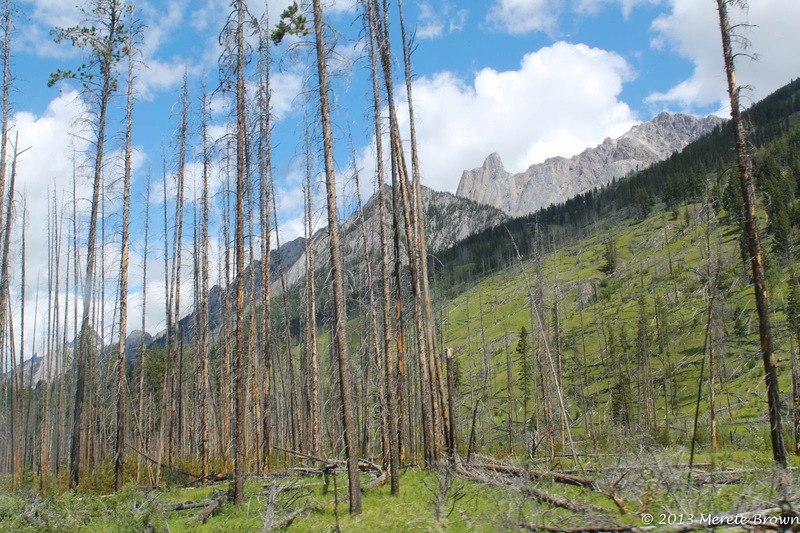 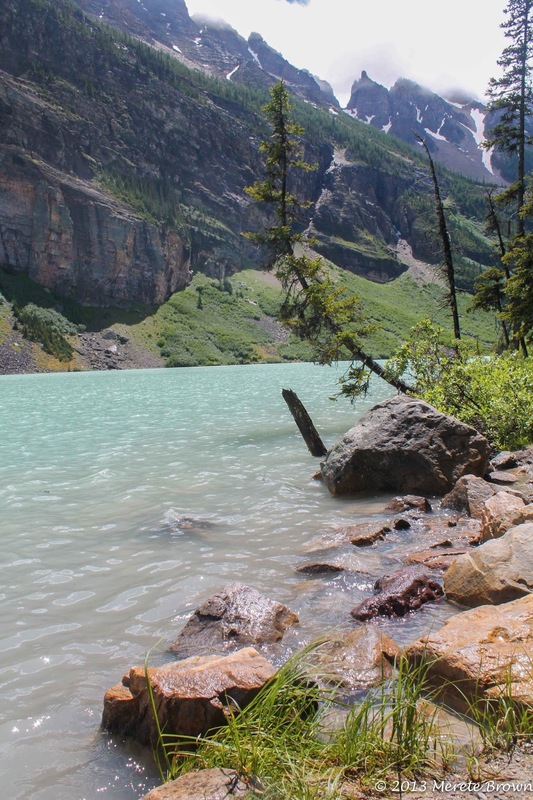 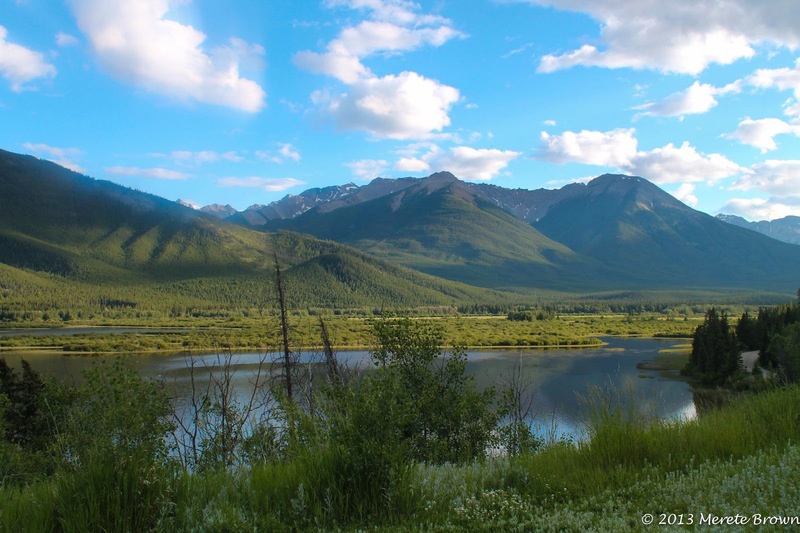 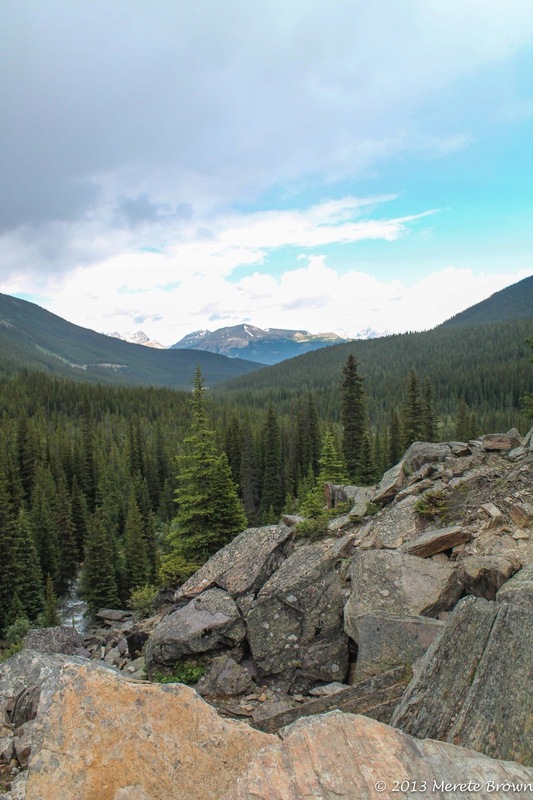 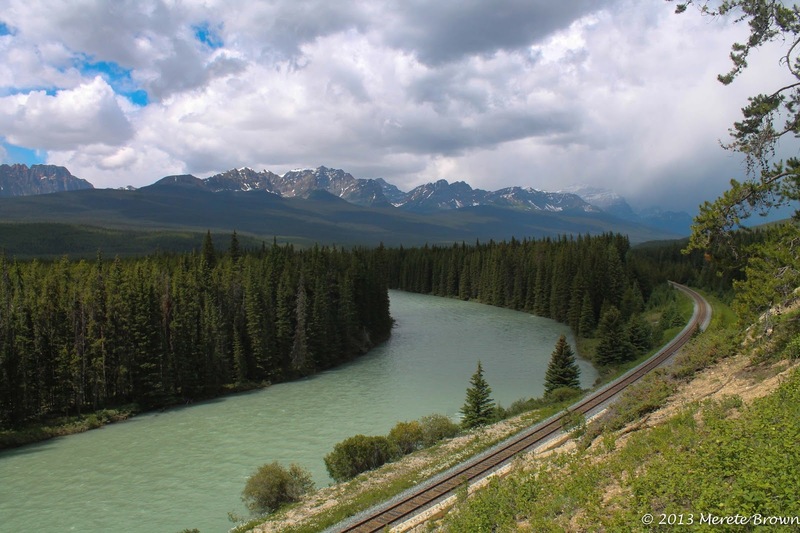 Although some of the worst flooding Alberta has ever seen recently affected the area, the region’s beauty is still breathtaking, rivaling the Swiss Alps. 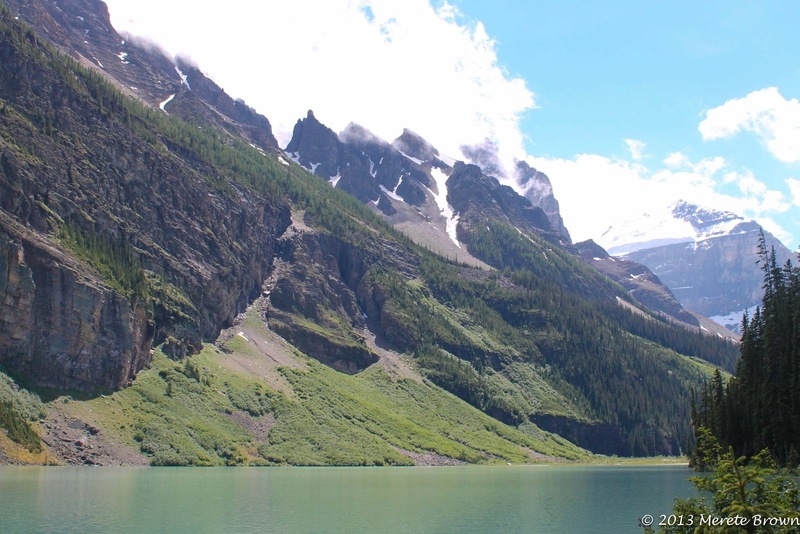 The town of Banff, itself, could surely neighbor ideal pastoral places such as Interlaken or Lucerne, Switzerland and not stand out of place. 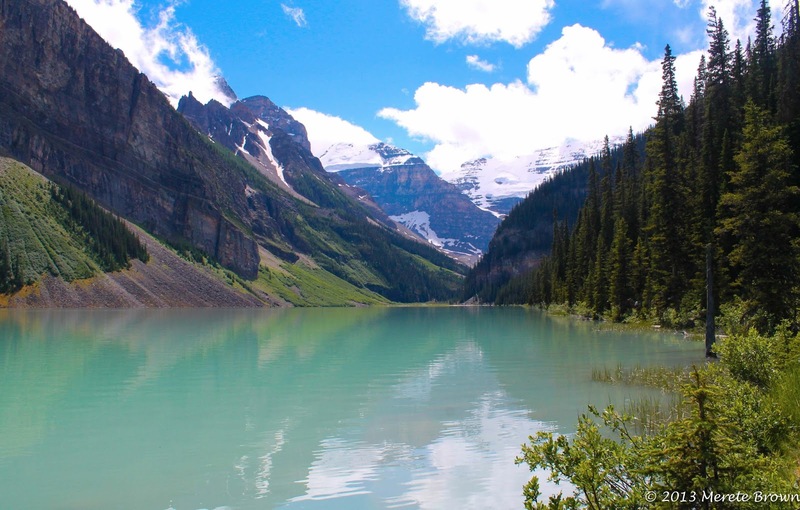 The town also has comparable architectural features that are reminiscent of the charming character of Swiss villages with its mountain streets lined with chalets, nestled within the soaring mountains. 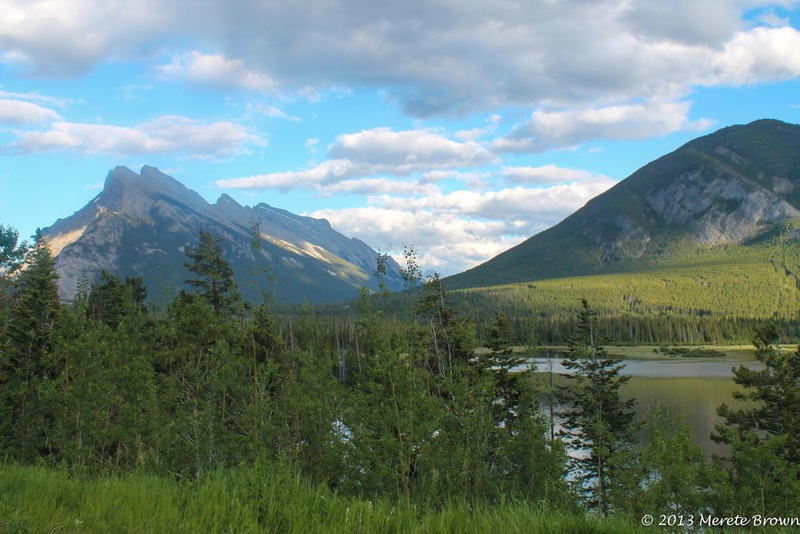 Canmore, Alberta, located south of the town of Banff, just outside of the national park, is equally beautiful. 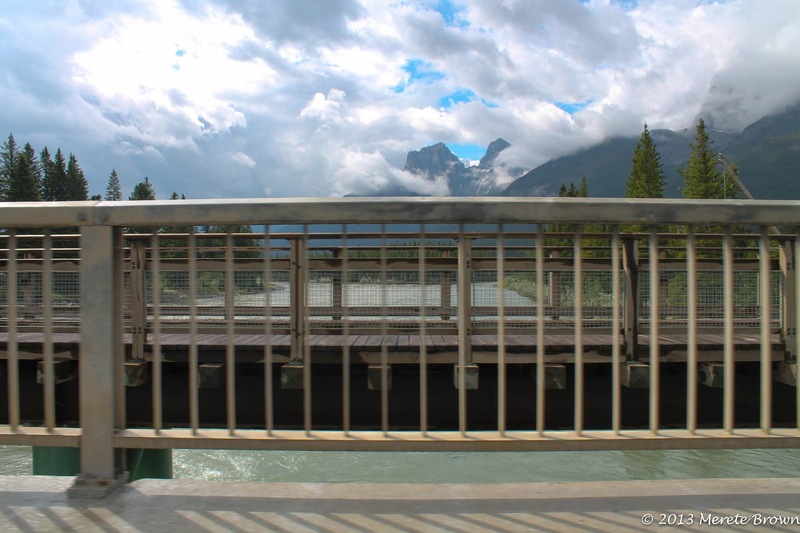 The town of Banff sits within the national park, so even if you decide to simply stroll around town for a day, you’re supposed to purchase a park pass. 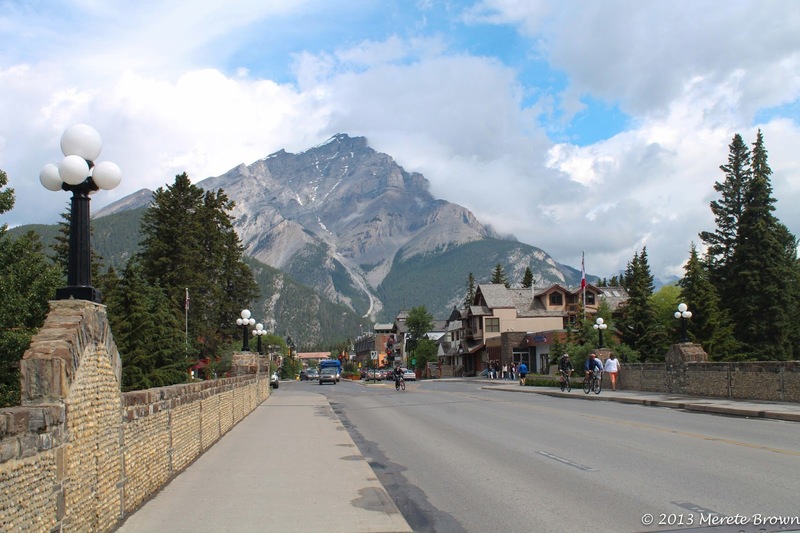 But of course, we didn’t go to Banff just to shop and roam the streets. 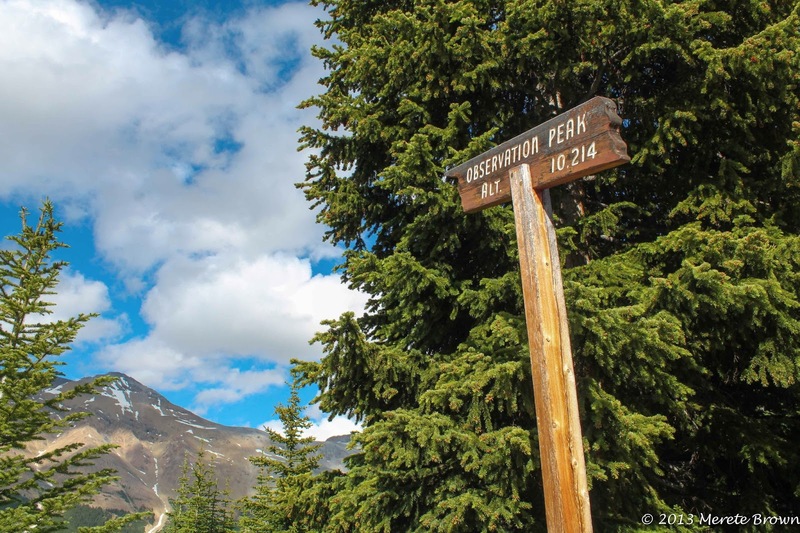 While exploring the national park and the surrounding towns, there is a plethora of hiking and biking trails, scenic drives, gondola rides and hot springs to choose from. 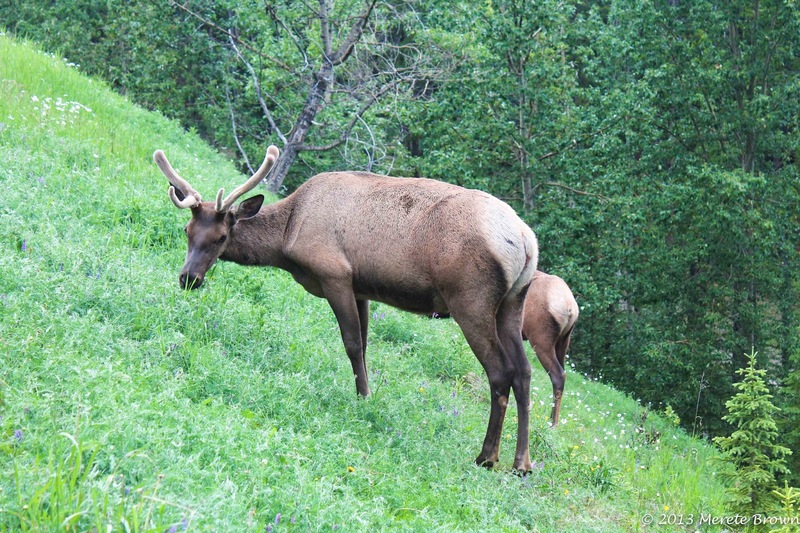 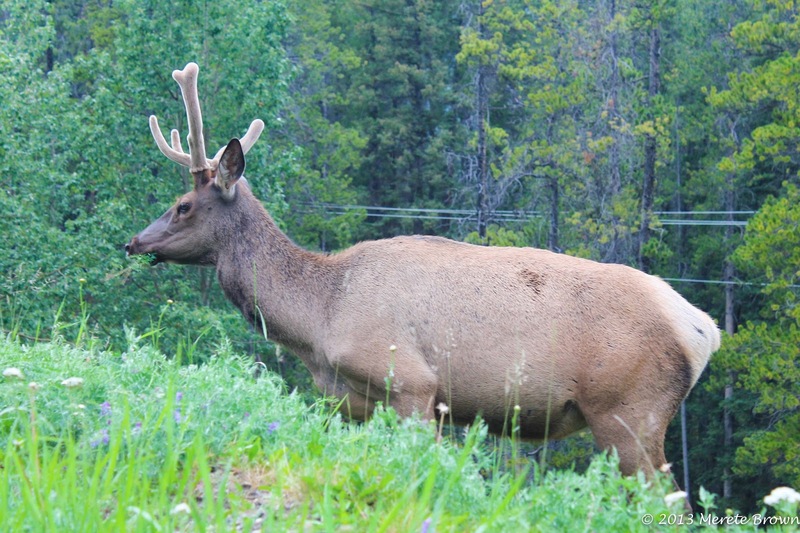 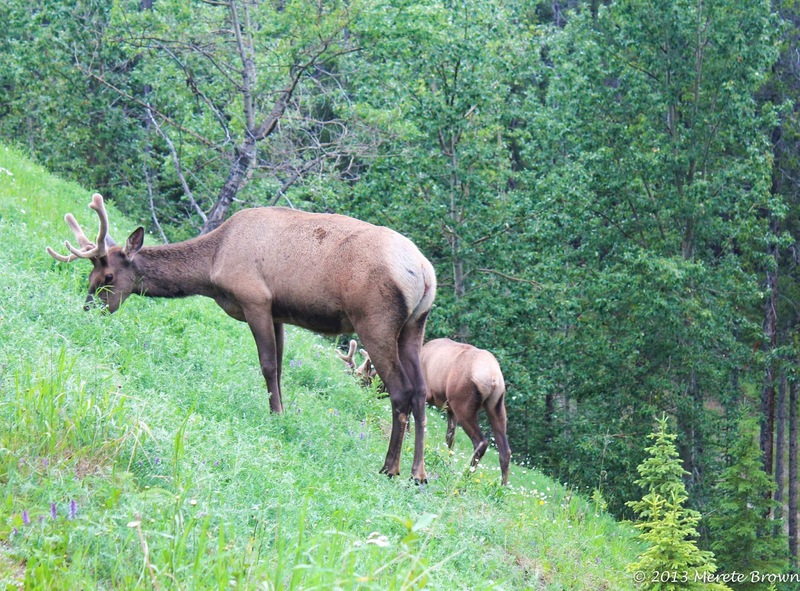 There’s also a good chance you’ll come across assorted wildlife chomping on the hillsides. 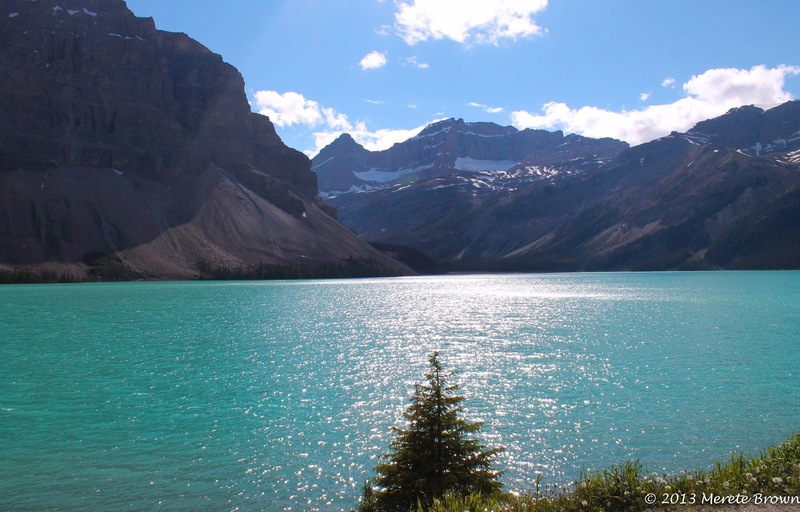 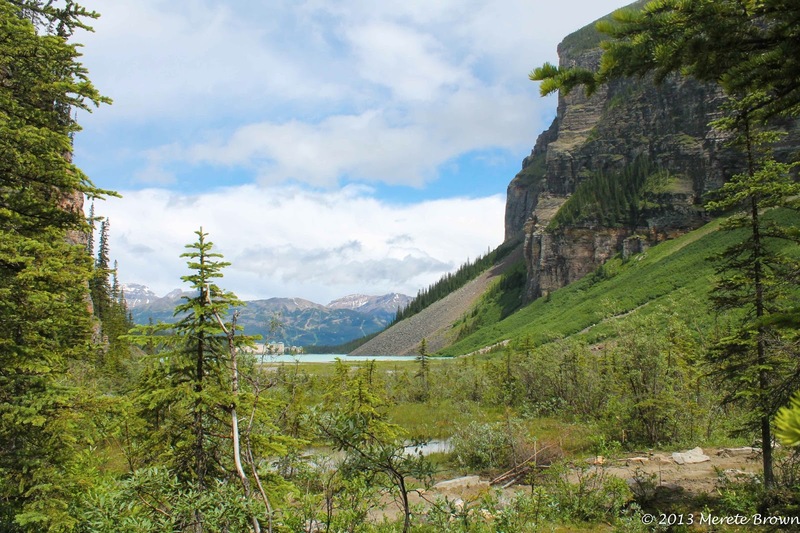 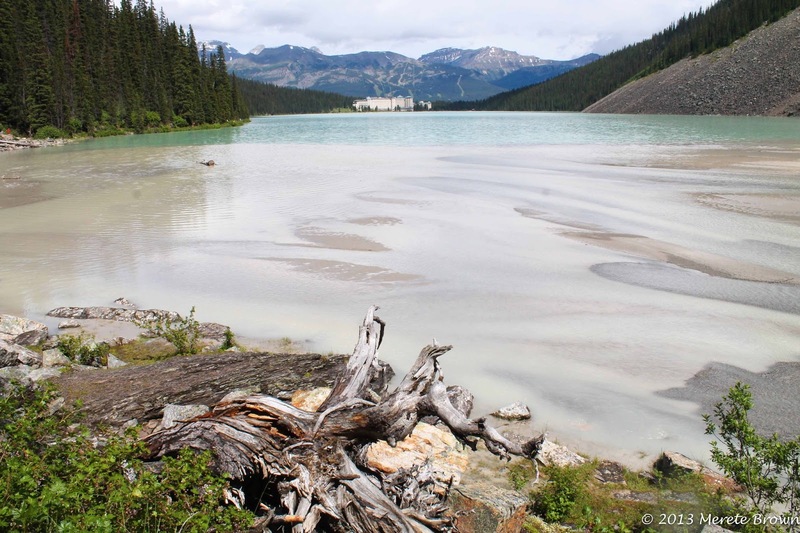 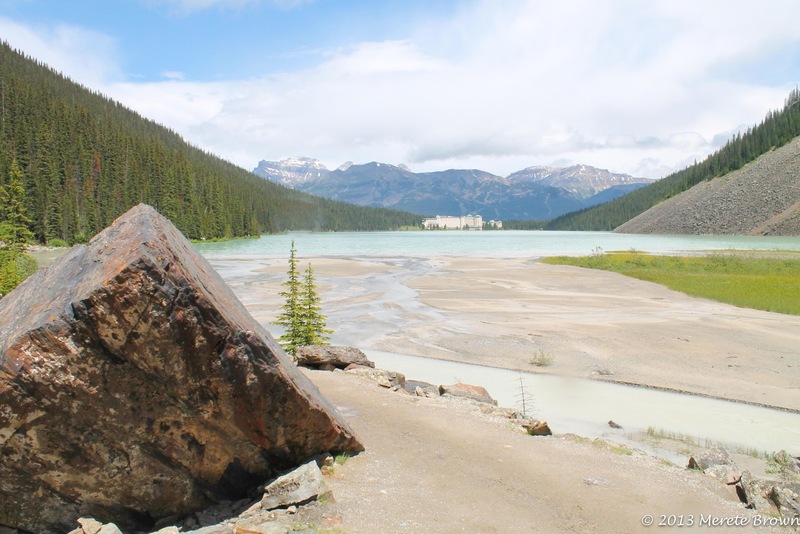 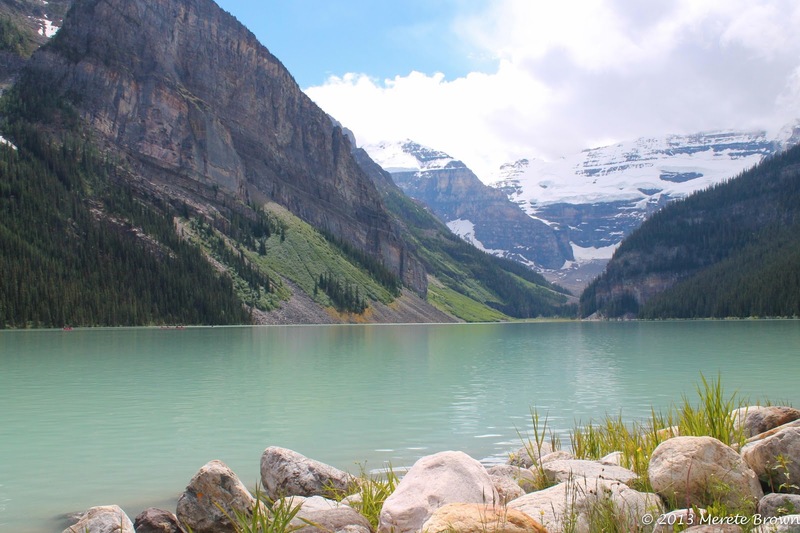 Some of the most popular and easily accessible attractions within the park are Lake Louise, Moraine Lake, the Icefields Parkway, Bow Valley and the Upper Hot Springs (located in the town of Banff). 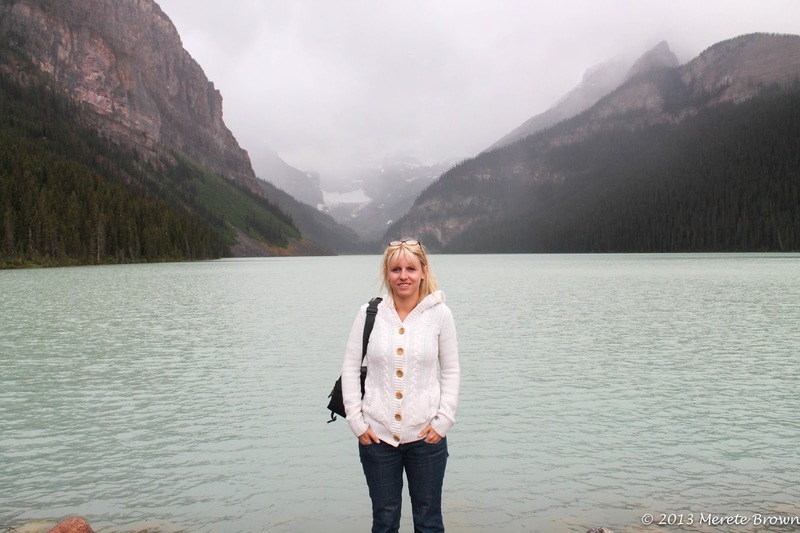 As always, since we only had a few days to explore, we tried to make the most of the short time we had. 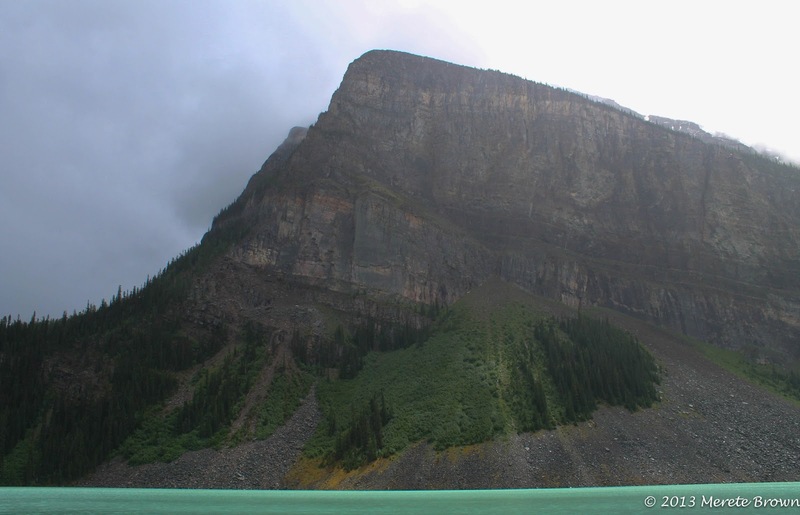 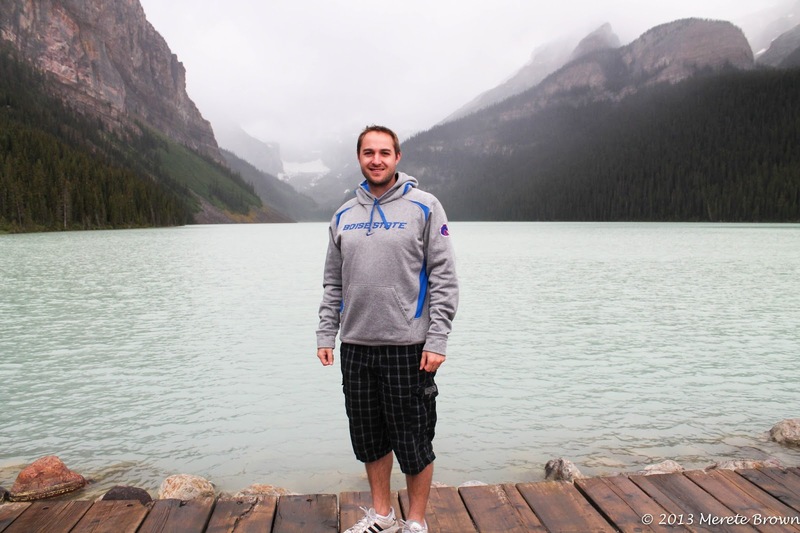 …Eventually ending up at Lake Louise. 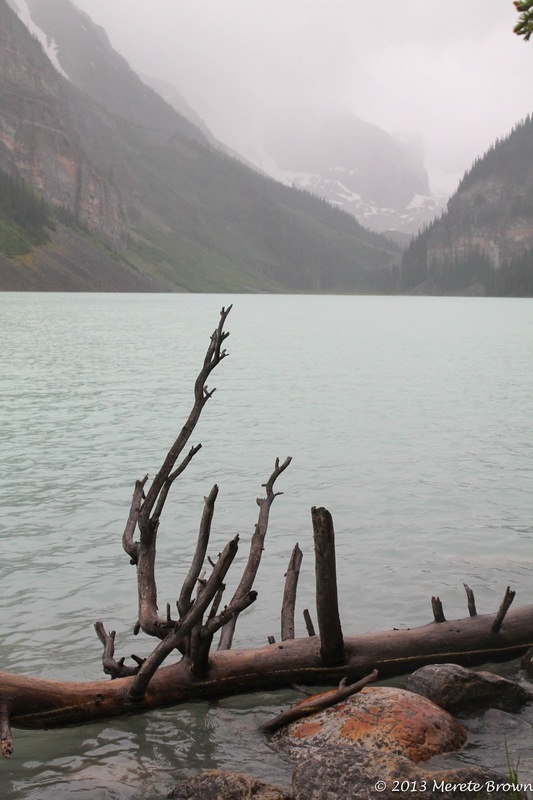 When we first arrived at the lake, a storm was brewing. 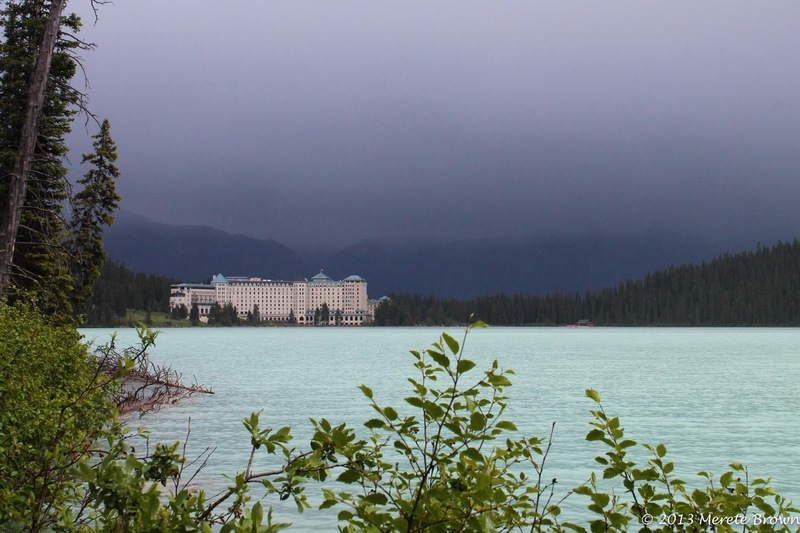 As we walked in the rain along a trail leading to the end of the lake, the famous Fairmont Chateau Lake Louise Resort sat huddled amidst the dark clouds. 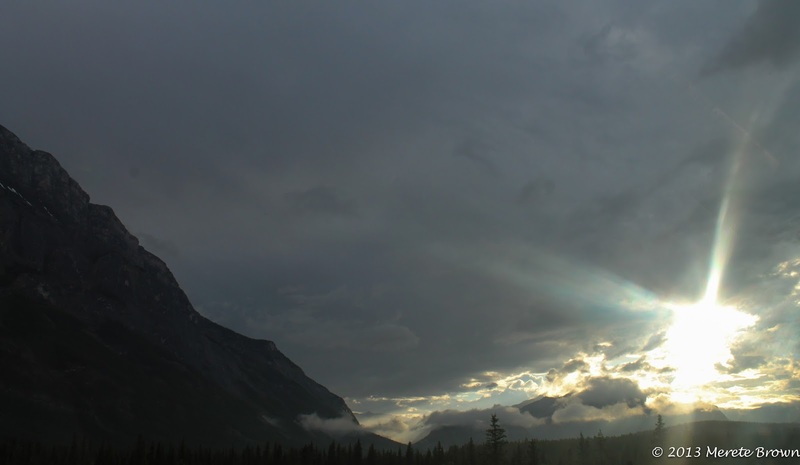 But as we continued to walk, the sky started to clear and a new scene unfolded. 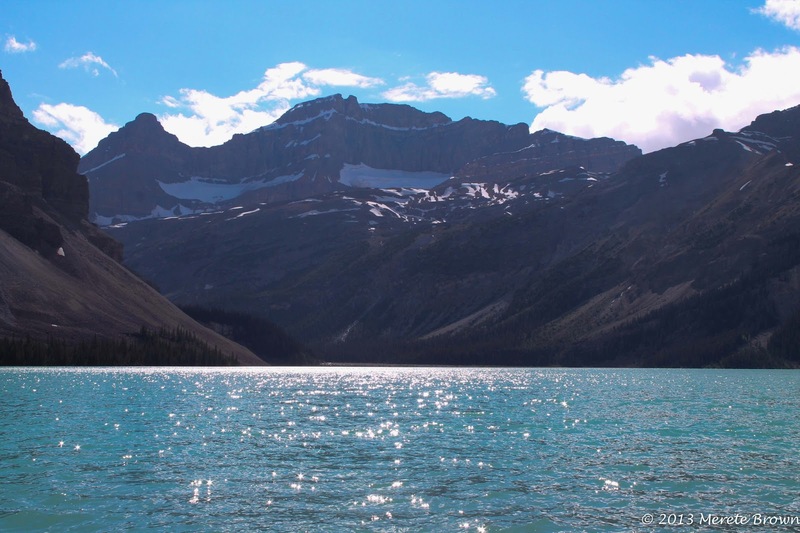 Once we made it to the end of the lake, the sky completely lifted except for some white puffy clouds. 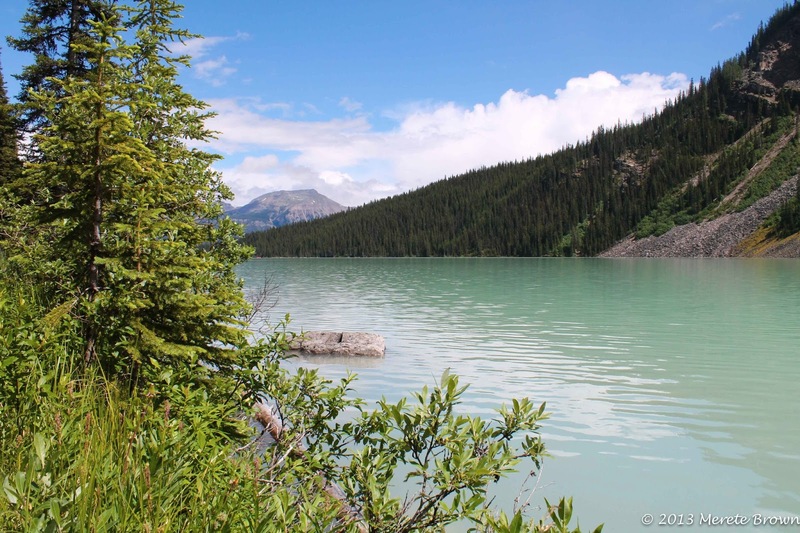 Due to the flooding in the region, the water leading into the turquoise blue lake was muddied but provided an interesting contrast in color. 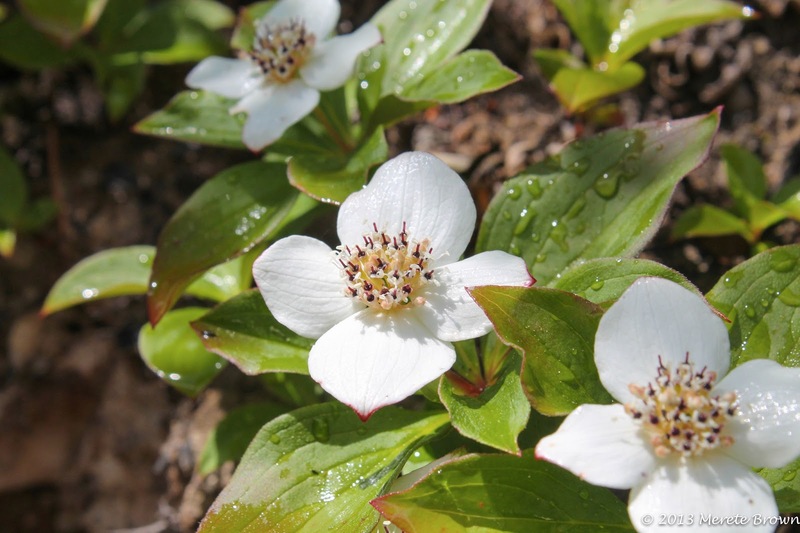 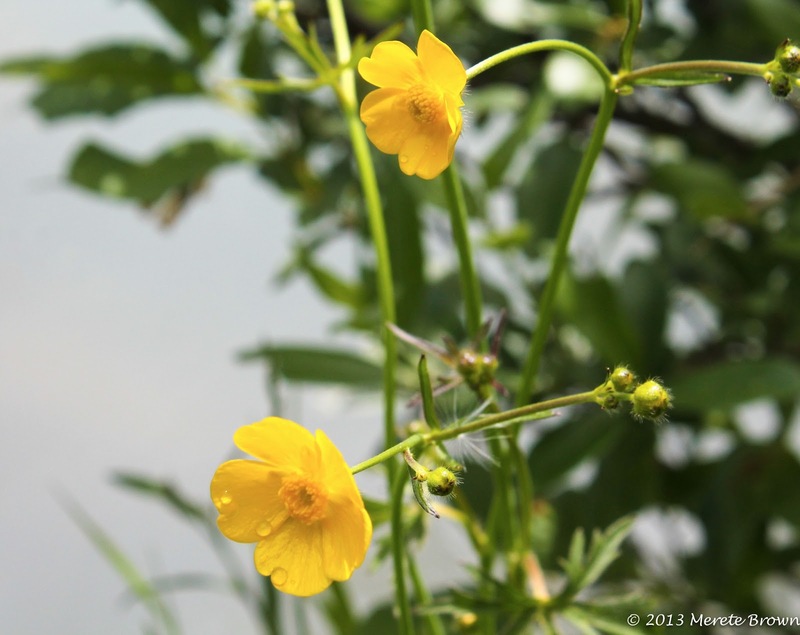 And of course, I’m always on the lookout for wildflowers. 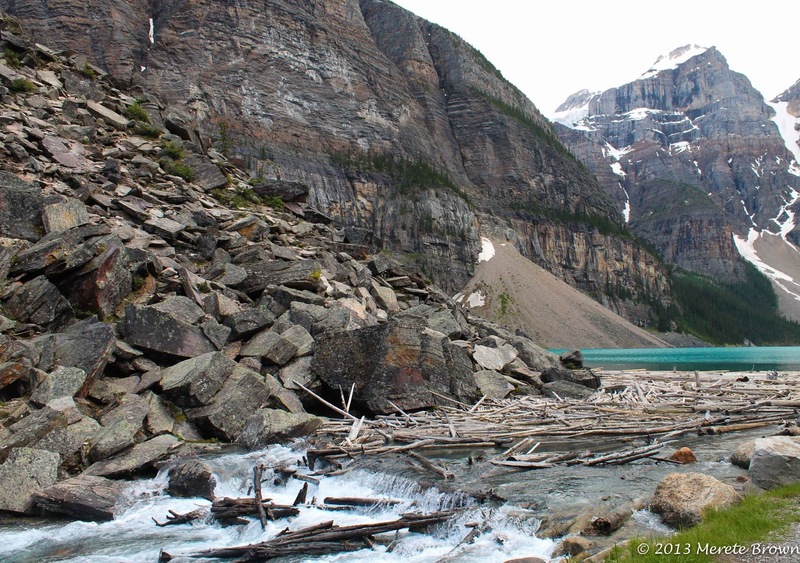 Our next stop was Lake Moraine; a short drive back down the road. 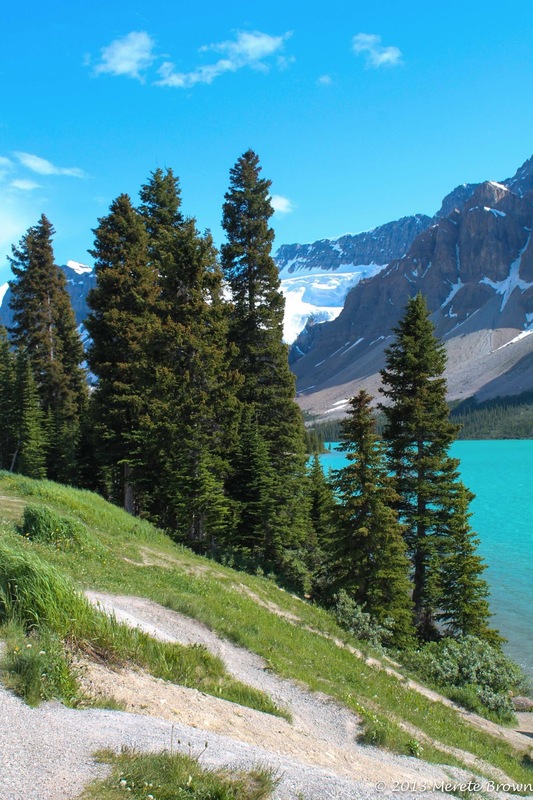 Lake Moraine was an even brighter shade of green. 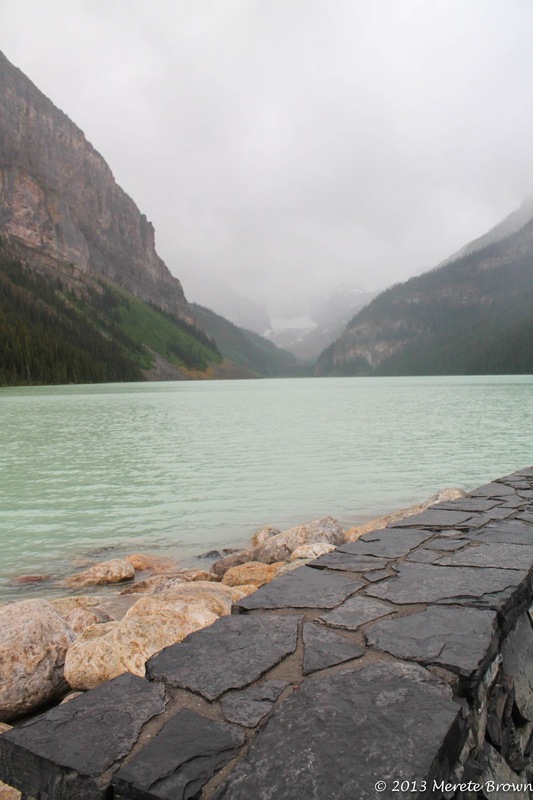 We raced up a short path to the top of a mound of rock overlooking the lake just as the rain caught up to us again. 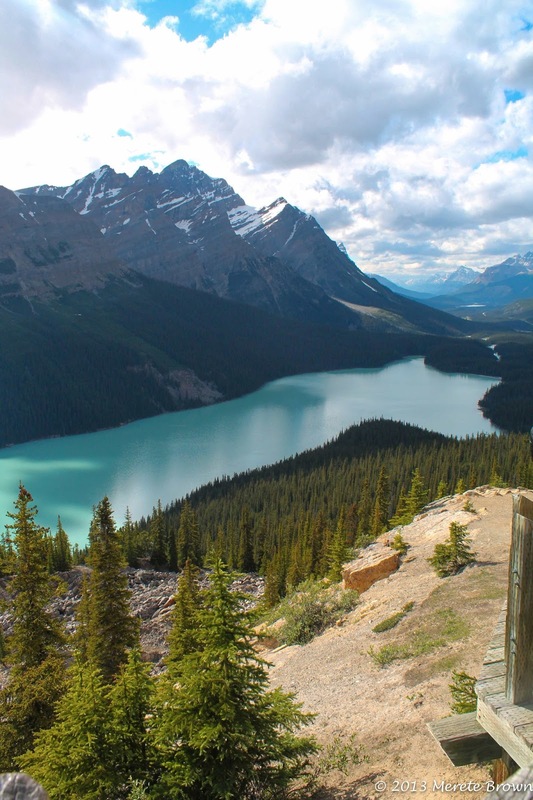 Then Bow Summit and Peyto Lake. 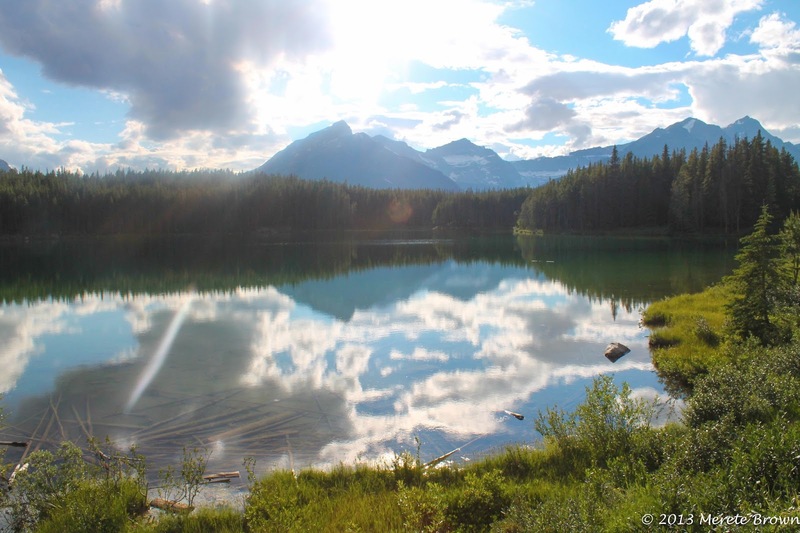 On the way back to town, we stopped off at Herbert Lake just as the light was reflecting perfectly off the water. 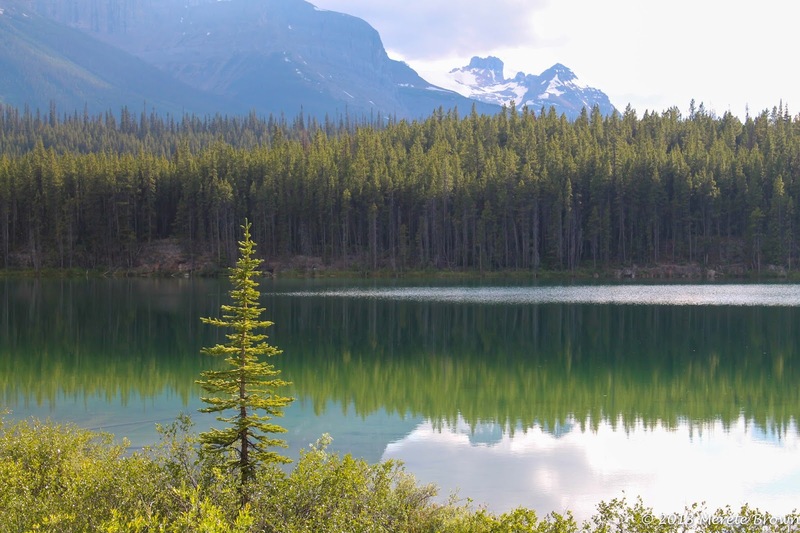 Many of the lakes in the national park act a pane of mirrored glass revealing nature’s reflection. 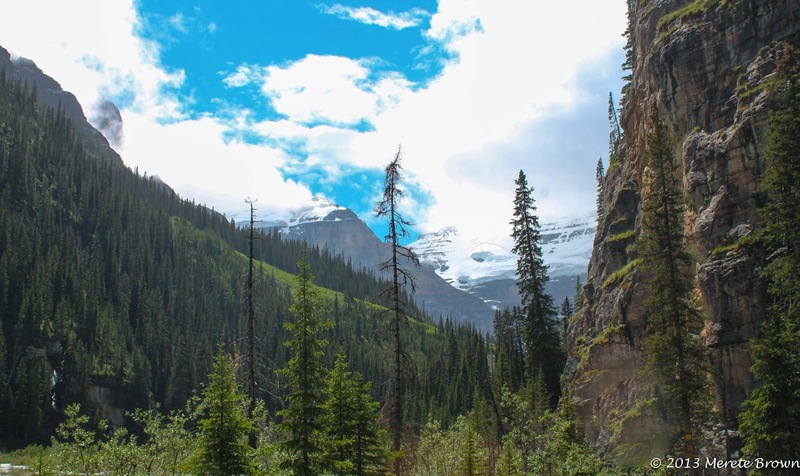 Wild Flour Bakery (211 Bear St #101 Banff, AB T1L 1B4, Canada) – Healthy food option – organic breakfast and lunch selections. 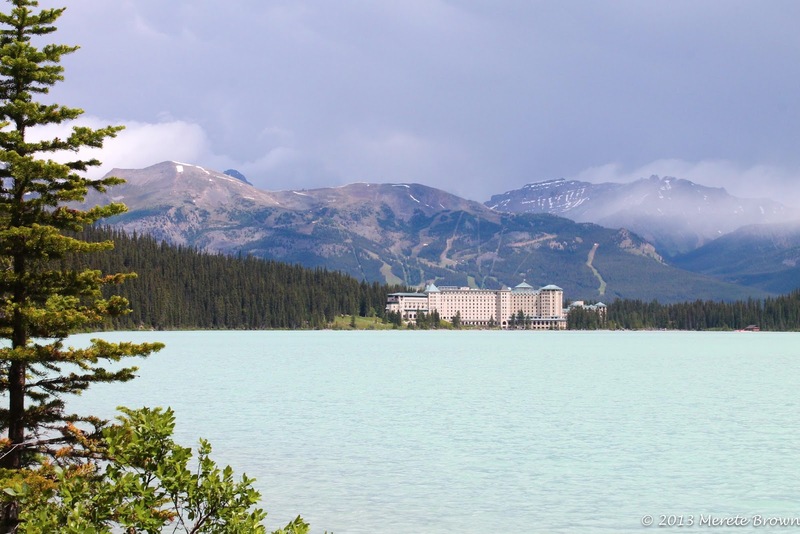 Chateau Deli inside the Fairmont Chateau at Lake Louise – European style deli – great for a snack or a quick bite to eat – try one of their croissants! 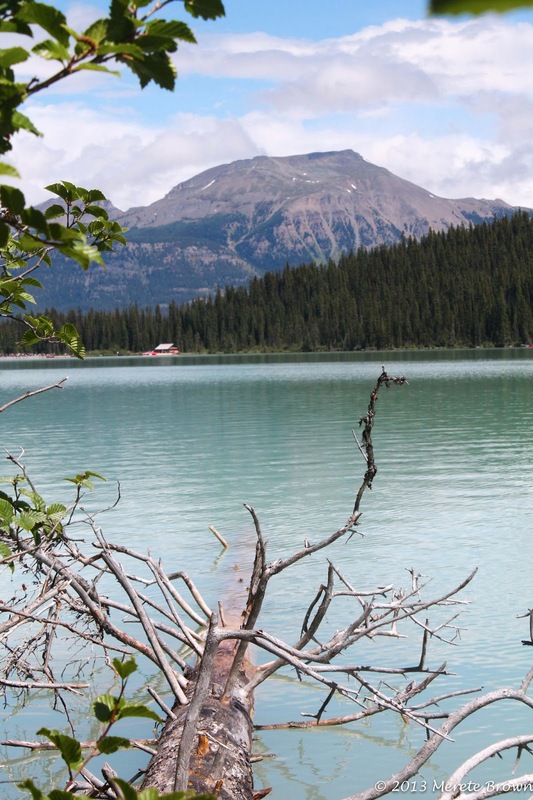 Summit Café (1001 Cougar Creek Drive Canmore, AB T1W 1E1, Canada) – Yummy breakfast choices and sandwiches. 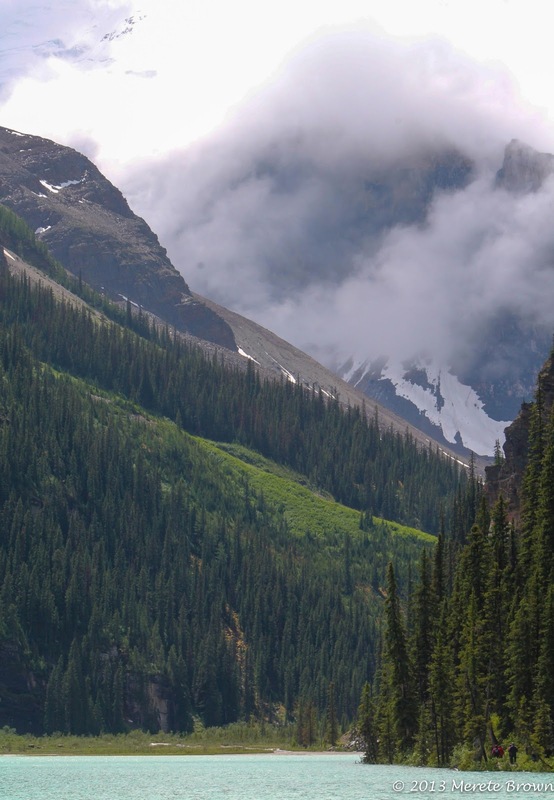 Wild Bill’s Legendary Saloon (201 Banff Ave Banff, AB T1L 1C4, Canada) – BBQ – Line-dancing on Thursday nights! 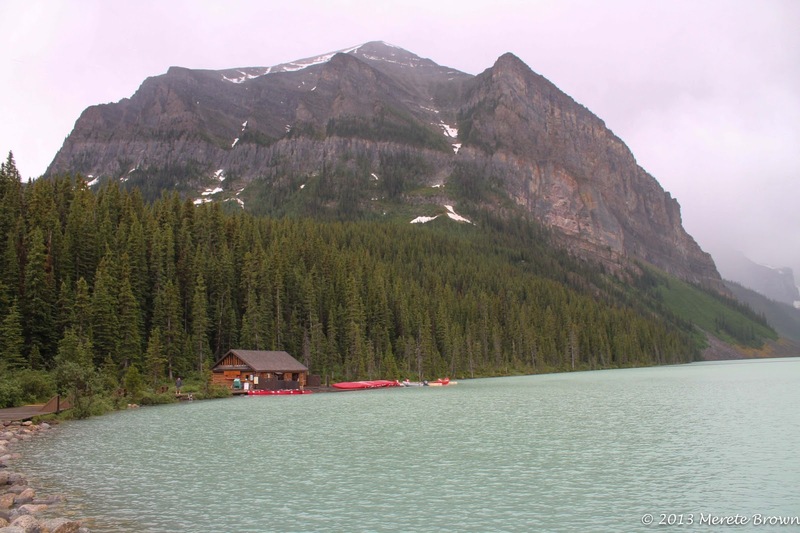 Maple Leaf (137 Banff Ave Banff, AB T1L 1B6, Canada) – Excellent food but spendy – steak, seafood and local game. 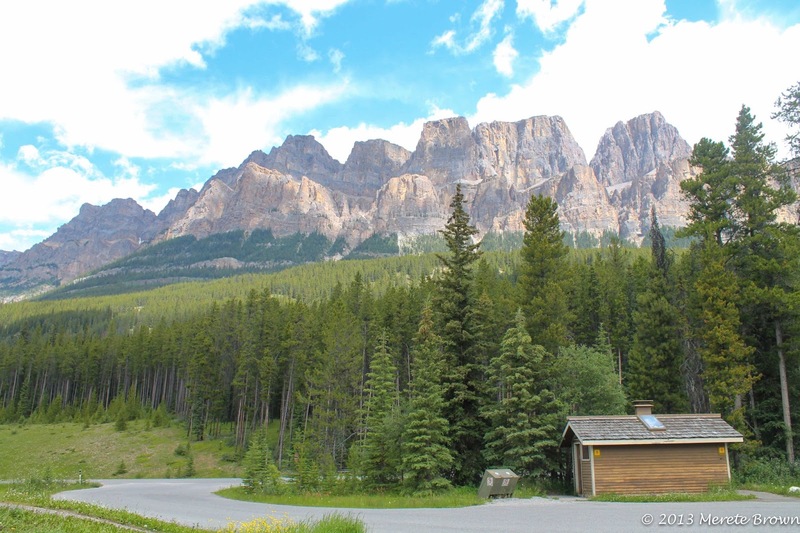 Banff Sweet Shoppe (#12 201 Banff Ave. AB T1L 1B3) – Fudge, fudge and more fudge! 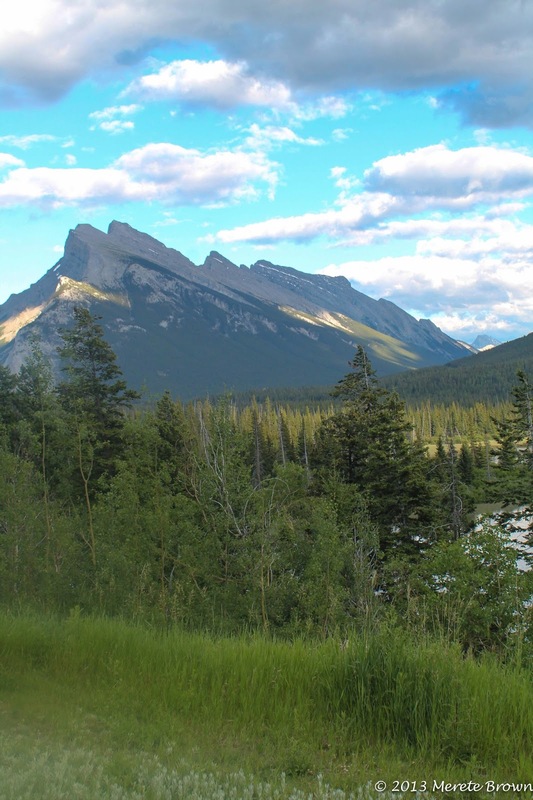 Also, consider staying in Canmore (only 15-20 minutes south) instead of the town of Banff for cheaper hotel rates! 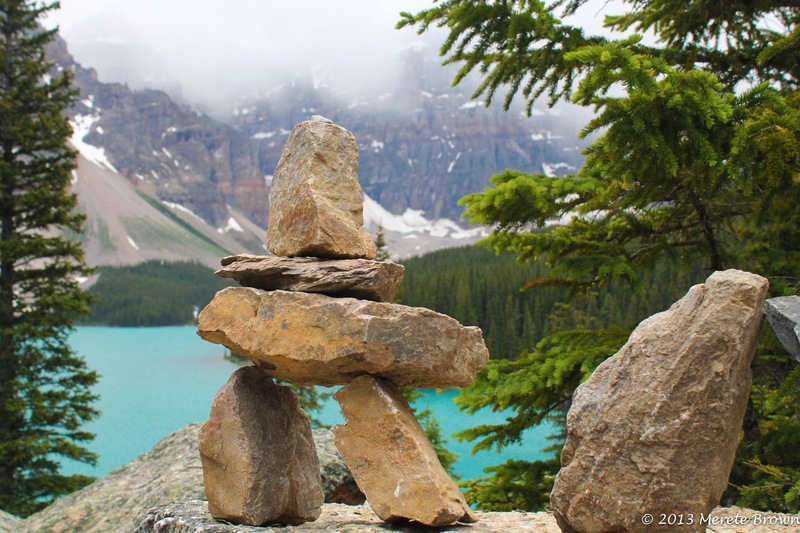 Travel Photo Carnival Round 3 Winner!